Golden Star Casino is where a cosmic win can happen. The casino’s unique offers are its tournaments that have a very large prize pool for any lucky players. 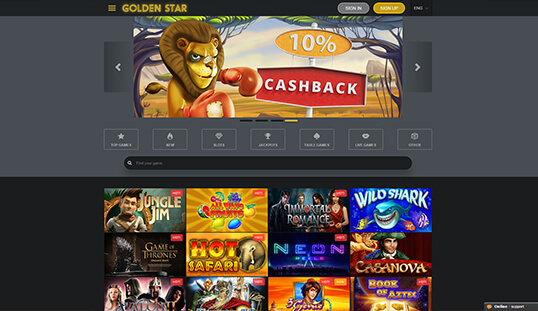 Golden Star Casino offers a large variety of casino games from different leading game developers. This casino contains more than 600 slots and casino games. 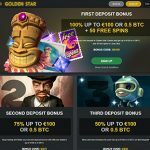 This is also a Bitcoin online gambling site since the casino accepts the digital currency. The biggest attraction of the site is its regular tournament events that contain a large prize pool. Jubise International N.V. Casinos created the Golden Star Casino back in 2012. This casino has a Curacao eGaming license. The team behind the casino ensures that the games can offer a fair result. This is why the casino only picks certified developers that have the right licenses. Golden Star Casino has a fair share of games. Some even use the provably fair feature. The feature allows players to see the seeds that will create a random number. Provably fair games can give players an ease of mind in knowing that no one is controlling the game’s result. All the SoftSwiss games have this feature. 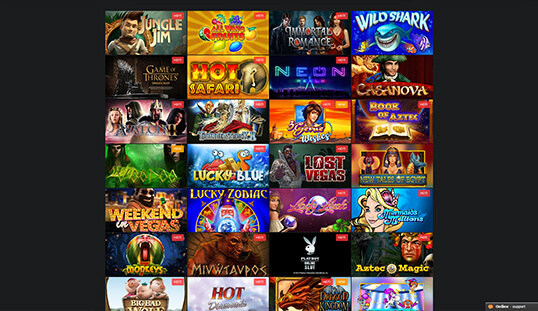 The casino contains many games from Betsoft Gaming too. The game developer is popular for creating games with high-end graphics. There are also live dealer games from Ezugi that provide an authentic casino betting experience. 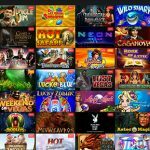 You’ll find several Bitcoin slots and other games here from NetEnt, iSoftBet, Endorphina, GameART, and Quickfire, among others. The SoftSwiss platform gives the casino a clean layout. Players can easily move around the website to find a specific game or browse through the library. The biggest feature of the site is its regular tournament. To join the tournament, you just need to make wagers on a certain selection of games. Each bet you make can give you points. Players with the most amounts of points at the end of the tournament will get most of the prize pool. Anyone can easily create an account in the casino. The casino simply needs an email address, password, and currency that you want to use. This allows you to play in the casino without using any personal info. 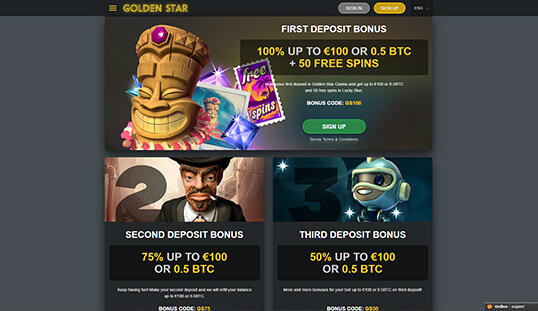 Golden Star Casino accepts credit cards and fiat payment options for deposits and withdrawals. To deposit or withdraw bitcoins, you need to use Cubits. There are no fees to making any deposit or withdrawals. All deposits are credited right away to your bankroll. Withdrawing to your credit card may take about one to three days. New players will receive three deposit bonuses. On the first deposit, you will get 100% of your deposit amount up to 0.5 BTC or $100. The second deposit will give you 75% of your deposit amount up to 0.5 BTC or $100. The third deposit can give you 50% of your deposit amount of up to 0.5 BTC or $100. Golden Star Casino also offers other regular promotions throughout the week such as its ‘Have a Nice Weekend’ promo. To take out any of the bonuses, you need to wager a number of times through certain games. The first deposit bonus, for example, needs you to wager it about 50 times. Golden Star Casino will work almost on any of the latest smartphones and tablets. Most of the games on the site are playable on mobile devices. The casino offers a live chat support that is available 24 hours a day. You can also click Support at the bottom to bring up a contact form to get in touch with a casino support staff.